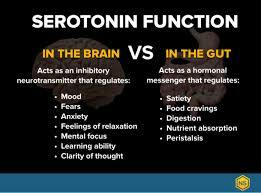 Serotonin is created by a biochemical conversion process that combines tryptophan with tryptophan hydroxylase. Serotonin is also a neurotransmitter, although some consider it to be a hormone. Serotonin is produced in the intestines and the brain. It is also present in the blood platelets as well as the central nervous system (CNS). Bowel function: It regulates bowel function and movements. It can also play a part in reducing the appetite while eating. Mood: Serotonin impacts levels of mood, anxiety, and happiness. Drugs such as Ecstasy and LSD cause a significant rise in serotonin levels. Clotting: Serotonin assists in the formation of blood clots. Nausea: It can stimulate the nausea area in the brain so that you vomit and have diarrhoea when you have consumed toxic food. Bone density: Some scientists linked high levels of serotonin in the bones to an increase in osteoporosis. Sexual function: Higher Serotonin levels can inhibit sexual activity. Diet – 95 percent of the serotonin in your body is produced in your gut. Take a quality probiotic, properly hydrating, and eating a brain-healthy diet. There are two ways that food can increase serotonin levels. Foods high in simple carbohydrates. The calming effect of serotonin can often be felt in thirty minutes or less by eating these foods. Complex carbohydrates, such as sweet potatoes, apples, blueberries, carrots, and garbanzo beans, is a healthier way to boost serotonin. Serotonin levels can also be raised by eating foods rich in L-tryptophan, such as chicken, turkey, salmon, beef, nut butter, eggs, and green peas.